On the day before Mahindra United World College’s winter break, the air is thick with nerves, relief, excitement. For the freshers, this is the first time they return home since arriving at the boarding school. The graduating class, meanwhile, is wrapping up a critical phase of their school lives—applying to universities. Raghav Malik, 16, straddles both worlds. Raghav didn’t see his brother’s angst as he spent hours surfing the Internet, pouring over brochures, discussing his interests with college counsellors Michael McGahan and Claire Timperley, filling out applications, writing essays, requesting recommendations, sending applications and waiting to hear. He did not witness the jubilation either when older Malik announced to his friends that he had made it to the prestigious Princeton University. But, as the younger brother sees a bunch of students break into spontaneous applause as one of their classmates proclaims that she’s gotten into Brown University, he gets a sense of the adrenalin rush that greets every success on campus—including his brother’s. In September, the older Malik began his freshman year at Princeton, joining five others who form the record number of Indian nationals at the member of the Ivy League. Mint has been tracking their stories as part of The Indian Education Dream series, which intends to follow the multi-year journey. In many ways, this school represented Malik’s first taste of alternative education. He arrived for the last two years of high school, knowing he wanted to study abroad in an environment that stressed freedom, diversity, possibility. It is a sentiment that defines this chain of prep schools across the world, with former South African president Nelson Mandela serving as honorary president and Queen Noor of Jordan as president. The India branch—founded by Harish and Keshub Mahindra; Keshub Mahindra is chairman of the Mahindra Group—draws students from 60 countries. 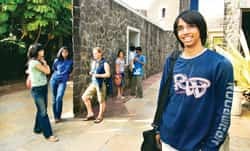 Almost all of the Indians, about 35% of the class, aspire to study overseas once they complete the International Baccalaureate (IB) programme at the college. The globally recognized qualification issued by the Geneva-based International Baccalaureate Organization is increasingly considered a ticket overseas. With only 37 Indian schools offering the IB diploma, the competition to get in is fierce. At this campus 40km from Pune, five of the graduating class of 110 students already have received admissions through ‘early decision’—an offer made by the university before the regular application deadline. The rest of the students face looming deadlines, mostly in January, and will know the outcome by April. As in previous years, more than 90% of the students from this elite college plan to study in a country other than that of their origin. The Mahindra United World College receives almost 700 applications from India alone, despite an annual fee of Rs7 lakh. Only 40 students gain admission in the college, which is part of United World Colleges, a London-based network of 12 colleges in its fold. Many students are offered aid though to make the programme more accessible. Raghav has a 50% scholarship. The 175-acre campus village, with its single level rustic-looking structures built with roughly hewn granite blocks, seems at once aesthetically pleasing yet randomly chaotic. The academic buildings are on one side of the campus and the residences on the other. Students live in small community set-ups called wadas (a cluster of houses in Marathi). Each wada has a parent, a faculty member who doubles up as guardian. Its lofty goal: “develop a critical consciousness of the issues and causes of division in our world and...enable its students to make a difference." Service is an integral part of the college, with students spending at least three to four afternoons each week in community programmes. One venture helps handicapped adults earn a living by making and selling hand-made candles, while another tutors students at a local high school. The college claims that students learn how to think, not what to think. Diversity is on display in the cafeteria. Students from different parts of the world sit around the tables, holding animated discussions, joking, and laughing. “It’s really very cool," says Raghav. For most Indian students, this is their first taste of what it is to study in an international environment. Clearly, many of them believe that from here there’s no going back to a regular Indian education. Raghav, too, plans to go overseas, maybe the US but UK is a more likely option. “I’m looking at bio; medicine is a significant possibility," he says. Princeton is ruled out. “Everyone thinks that because I went to the same school that my brother went to and the same college that my brother went to, I will follow him to Princeton. Definitely not!" says Raghav with a grin. “There’s still time for me to decide." For now, he can afford to relax and watch his seniors crowd around the college counsellors’ office as they rush to meet university application deadlines. Outside the office, Rashi Sabherwal is one senior in the last stages of the process. She fills out envelopes, puts the applications in and seals them before they make the long trip from Paud across the world. Like many of her peers, Sabherwal has applied mostly to universities in the US. Counsellor Timperley says more than 70% of the college’s graduating class go to the US and about 15% go to Europe. “The US is popular with students not just because it is easier to get funding but also because it gives them the opportunity to try out a broad range of things, such as liberal arts, along with another stream of study," she says. The US tops the chart of leading international education destinations with a total of 582,984 in the 2006-07 academic year—and India sends the most students, according to the Open Doors report released by the Institute of International Education. Last year, the number of Indians studying at American universities and colleges grew 10% to 83,833. Universities across the world actively work to attract international students. Every year, the Mahindra United World College plays host to 30-40 universities. Streamers of university flags, given by the representatives, flank the walls of the college’s guidance office. The Ivy League, such as Harvard and Cornell, share space with others such as Colorado College, Franklin and Marshall College. “There is surely an increase in the number of universities visiting our campus with even some of the less famous ones sending their representatives," says counsellor McGahan. “Obviously, the universities see value in having a diverse student body." In fact, it was a visit from a Princeton University representative to this campus that had started the older Malik thinking of the college in New Jersey as the place for him. Last year, he had just gotten back to his parents’ Gurgaon home on his holiday break from the college when he found out by email that he had gotten in early decision, a practice Princeton has since stopped. That saved him from having to complete any more applications. This Christmas break, Malik is back with his parents but says it is far from relaxing. “Princeton, unlike most other schools, has its exams after the winter break, so I’ve got loads to do," he says. Students from the United World College network applying to Princeton and four other institutes—Colby College, College of the Atlantic, Middlebury College, or Wellesley College—have an added advantage. They get a full scholarship through the Davis United World College Scholars programme instituted by the Shelby Cullom Davis Foundation. United World College applicants to another 80-odd schools get partial scholarships of about $10,000 (Rs394,000). Malik’s education at Princeton, for instance, is fully funded by the foundation; Shelby Davis graduated from Princeton in 1930. “The good thing about this is that it helps students narrow down their list," says McGahan. The guidance office has developed other tools to help students sift through the thousands of options, such as a database of details on the previous batch. It lists students’ IB scores, SAT scores, the colleges/universities applied to and the outcomes, including information on financial aid. Students use this document to compare their own scores with those of their seniors and get an approximate indication of where they would have the maximum chances of gaining admission and assistance. The two counsellors meet each of the students in the graduating class and help them identify the universities they could apply to. “We discuss their interests, what they want to do, but more importantly we prompt them to justify their choices," says Timperley. On the last day, the guidance office is relatively empty as much work on applications is done. Most of the students and faculty are busy packing up to go home for the holidays. Raghav Malik is going home too. When both sons left home more than four months ago—one to Princeton and the other to Paud—it was the first time their parents had to deal with an empty nest. “Mom said she felt like it was doom’s day," says the younger sibling. The two brothers have had few occasions to interact, having spoken to each other just twice since September. In fact, they have had to relay messages to each other through their parents. “We have a lot of catching up to do," Raghav Malik says. This time, his older brother will have stories of Princeton, just as two years ago he did about United World College—inspiring the younger to follow his footsteps.